One of four cruise ships in Disney's fleet, the Disney Fantasy launched in 2012 to wild acclaim and has been dazzling cruising families ever since. Recently the Fantasy received some amazing enhancements to some key spaces, giving everyone in the family new ways to enjoy the ship. Each new area is chock full of Disney details and cool features. Here's how to make the most of your time on board the newly refreshed Disney Fantasy. Take advantage of Disney Cruise Line’s online check-in, available for first-time guests 75 days before your departure date up until four days before you sail. Online check-in saves you time on embarkation day, and you can use online reservations to request a preferred dinner seating, choose special dining experiences, and book shore excursions, spa treatments, and other special experiences. Before you sail, be sure to schedule a free character call to your phone from Mickey or Goofy. The first thing to do once you board the Fantasy is to download the Disney Cruise Line Navigator mobile app, which has deck plans, activity schedules, and even dinner menus. The app will remind you when your favorite activities are about to begin, and there’s a handy chat function that lets you keep in touch with family members on board. (Be sure to put your smartphone in airplane mode for the duration of the cruise.) If you prefer a paper guide, you’ll find the Personal Navigator in your stateroom every evening with a schedule of the next day’s activities. Kids ages 3 to 12 will clamor to check out the Oceaneer Club, where they can attend the Marvel Avengers Academy, get Jedi training to combat Stormtroopers, join in a Disney princess party, or do a cool science experiment. For the first time on a Disney ship, kids can learn the ways of the mystic arts with Doctor Strange and open secret portals to different locales around the Marvel Universe, or come face-to-face with mighty Thor to find out what it takes to become a true hero. Kids can build and decorate their own hammers and learn how to use them to battle evil forces. Older kids and adults can check out this fun space during Open House, available several times during each cruise. Note that all Disney ships offer children ages 6 months to 17 years age-appropriate, imaginative spaces to meet friends and have wonderful adventures. In cozy Flounder’s Reef Nursery, the youngest seafarers can play games, make crafts, watch movies or even take a nap. In the Oceaneer Club, preschoolers can play dress up in Tinker Bell’s Pixie Hollow or slide down a Slinky Dog slide in Andy’s Room from Toy Story, while school-aged kids can join in Marvel super-hero training or pilot the Millennium Falcon from Star Wars. Pre-teens and teens have their own cool hangouts and schedule of fun activities. No cruise on the Disney Fantasy is complete without a ride on the shipboard water coaster, AquaDuck. This amazing, 765-foot flume ride spans four decks in height and features twists, turns, drops, acceleration, and river rapids. Riders get a fabulous view of both the ship and the sea as they glide around the top deck in a transparent tube. Kids ages 3 to 12 are transported to a galaxy far, far away in Star Wars: Command Post, another new space in the Oceaneer Club. Here children learn how to harness the power of the Force and embark on missions against the First Order. They also get quality time with BB-8. A highlight of your cruise is the day (or maybe even two) you're in port at Castaway Cay, Disney's private Bahamian island. Each guest's cruise fare includes access to the island and youth areas, a barbecue lunch buffet, non-alcoholic beverages, and self-serve ice cream. Guests can use their ship stateroom key cards to charge incidentals such as alcoholic beverages or rentals for bicycles, snorkel gear, or watercraft. Use the Disney Cruise Line Navigator app or Personal Navigator guide to find out where your favorite Disney characters are meeting on the ship for photo ops. During your cruise, you can meet Mickey, Minnie, Donald, and the classic fab five as well as Disney princesses and other characters from the Star Wars and Marvel universes. Got a sweet tooth? Families can come together for a treat at Sweet on You, an adorable specialty ice cream emporium themed after classic Mickey Mouse cartoon shorts. Designed with charming old-school details, Sweet on You features hand-crafted gelato and ice cream, specialty sundaes (that come in a souvenir Mickey or Minnie bowl), melt-in-your-mouth macarons, homemade chocolates, truffles, and penny candy for purchase. Note that you can also always visit the complimentary ice-cream station on the pool deck for soft-serve anytime you like. ​Be sure to reserve at least one meal at Remy or Palo, the two adult-exclusive dining rooms on the Fantasy. Remy is a sophisticated and lavish dining experience offering French-inspired, gourmet cuisine by two award-winning chefs, while Palo serves delicious modern Italian cuisine in an upscale atmosphere. A Disney Cruise isn't just for kids. When you want some zen time for yourself, head to Senses Spa & Salon for a massage, facial, or seaweed body wrap. This relaxing space features the Rainforest Room, which features a variety of tropical, aromatic showers and heated, mosaic tile loungers placed to offer calming ocean views. Afterward, grab a healthy pick-me-up at Senses Juice Bar, where juices and smoothies are made to order with fresh fruits and vegetables, along with other nutritious ingredients such as almonds, chia seeds, yogurt, and turmeric powder. 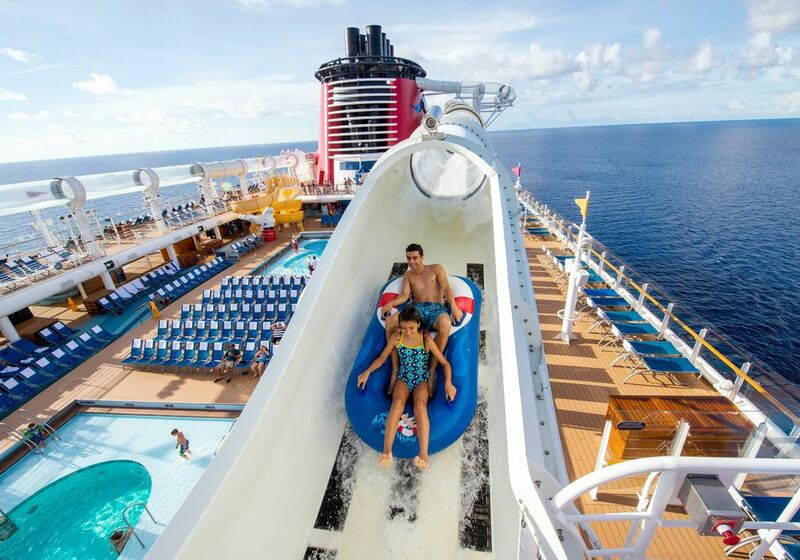 For families that love Disney entertainment, a Disney Cruise is a slice of heaven. All day long, Disney films (including first-run movies) are screened in the ship's beautiful Art Deco-style Buena Vista Theatre and also on the giant Funnel Vision screen on the pool deck. Every evening, families can take in a different Broadway-style musical in the Walt Disney Theatre, complete with many familiar songs and some truly magical special effects. Later on, cap off a perfect day by ordering milk and cookies from complimentary room service and catching up with even more Disney entertainment in bed. Along with popular TV networks (including Disney Channel, Disney Junior, and Disney XD) and a selection of recent live-action movies, you can choose from a large trove of classic and Pixar animated films available on demand 24 hours a day. Dream of sailing to a galaxy far, far away? Star Wars Day at Sea is a day-long celebration aboard special sailings on the Disney Fantasy. The full-day Star Wars celebration includes a deck party, meet-and-greets with favorite intergalactic characters, Star Wars-themed youth activities, unique food and beverage offerings, and special merchandise. On this day, families are encouraged to dress up in their own stellar costumes. A shipboard version of the popular Jedi Training Academy experience (available at Disneyland and Walt Disney World) invites young Padawans to learn lightsaber moves from a Jedi Master and then use the Force and face off in a final test against Darth Vader. Families can also enjoy friendly competition during Star Wars trivia games and attend at-sea screenings of all the Star Wars films as well as the Disney XD animated series, Star Wars Rebels. Occurring one day on select 7-night Disney Fantasy sailings, Star Wars Day at Sea is featured on itineraries sailing in early 2018 from Port Canaveral, Florida, to the Eastern and Western Caribbean.